John Deacons (2015) yellow clematis in two double overlays faceted paperweight. John Deacons 2000 two pink clematis blooms in a rose colored double overlay paperweight. John Deacons rose bouquet and ladybug blue encased double overlay faceted paperweight. 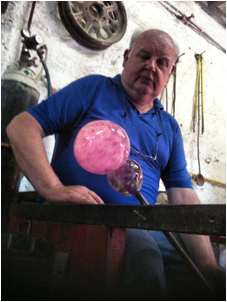 John Deacons 2017 marbrie and rose cane in matching color paperweight. John Deacons 2014 close packed millefiori cross magnum paperweight. John Deacons and William Manson 2006 collaborative clematis garland millefiori paperweight. John Deacons 2015 purple pompon on latticinio swirl paperweight. John Deacons 2018 Clichy-type rose and swirl paperweight. John Deacons 2018 "Fortress" square-patterned millefiori paperweight. John Deacons 2017 square-patterned millefiori and twists paperweight. John Deacons 2018 "Clichy Square" patterned millefiori faceted paperweight. John Deacons 2018 Clichy-type rose swirl paperweight.